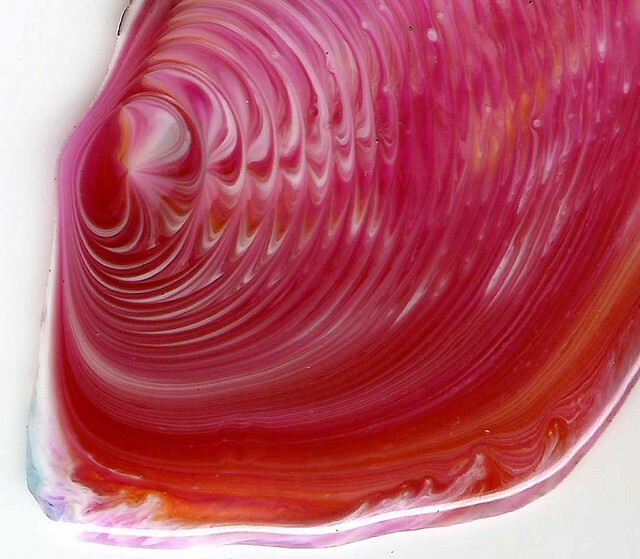 Momoko Sudo is an artist who works in a variety of media, including colored epoxy resins. She has a blog that's a good starting point to explore her work. It's all abstract, so it may not be everyone's choice for art, although I certainly enjoy it. 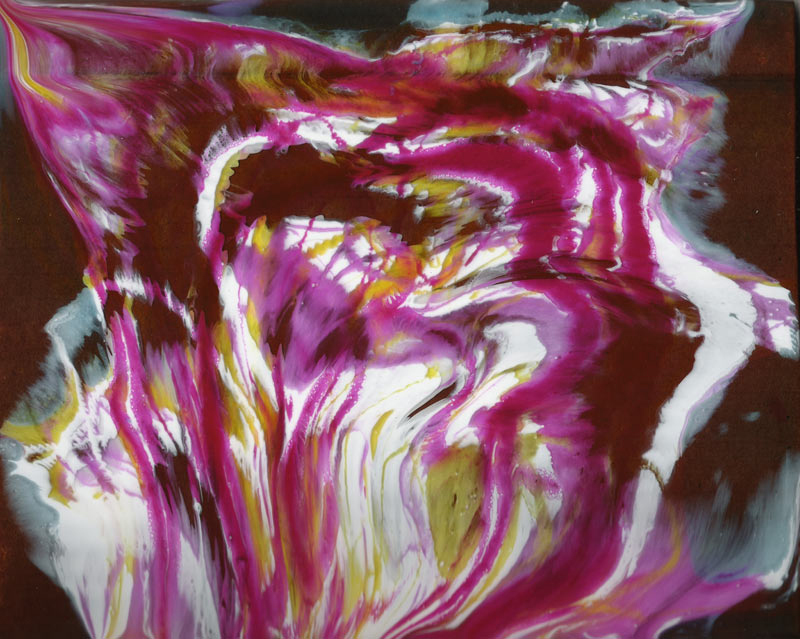 And maybe in the same way in which art and science are at opposite ends of a continuum, she calls the epoxy resin by the term "resin" while we would call them "epoxy". The picture above captivated me, not only because of the colors, but also the wrinkles in the drop. (No idea what size the drop is.) I've seen piles of polymers before with similar surfaces, usually sitting at the end of an extruder that is undergoing a purge or such, where a steady stream of hot material is piled onto a cooling base. But this is supposed to be just epoxy, or more correctly, curing epoxy. How would it have gotten such wrinkles? Given the small drop size, I imagine any adiabatic build up of heat would be limited, so that the drop should be more or less isothermal, and so should the cure (there should be no oxygen inhibition in an epoxy either). Any ideas? Not knowing any more than what I see in the picture, I'm baffled. It appears that this drop has flowed, but how could it have? The blog description does say "tiny drip." This could also be interpreted as "mini drizzle" and thus a sort of vertical extruder - I would guess the uncured epoxy used is lower-than-average viscosity. I'm guessing that the material cures at a slow speed so that the artist has a long working time. I could be wrong, and a fast curing epoxy would have a stonger exotherm, internal heat build up,... all conditions that would make it easier to explain the drop. I may have to break down and contact the artist directly. If I hear anything back, I will certainly inform you. John, I just emailed you a brief "answer" to your question. I will post the complete response here tomorrow when I have time to do so. Basically there are no wrinkles on the drip, thus you people are correct in a sense that epoxy does not cause such wrinkles in the process of dripping as being cured. And you were wrong in that there were wrinkles on the drip. You people were totally deceived by the optical illusion of the stripes! The drip is entirely smooth and flat. The actual drop was probably 1 inch or so in size. The epoxy resin with different colors of pigments were dripped from about 4 or 4 inches in height and kept dripping in a thread-like fashion. This is the type of work that produced drops. The drop was about 1 inch wide and about 1.5 mm thick. I might speculate the particular uncured epoxy utilized will be lower-than-average viscosity. Can You Design the Next Great Symbol? Would You Want to Process This Recycle Steam? Will the Supreme Court become Probabilistic? Think It's Obvious? Prove It.